In 4E 201, the General very nearly executed both Ulfric Stormcloak and the then-anonymous Dovahkiin before the fateful attack on Helgen by Alduin. Tullius survived the encounter and made his way back to Solitude to continue to wage war against the Stormcloaks. While concerned about the return of the dragons, he refused to let it distract him from his objectives. 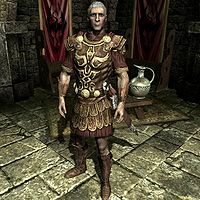 As Ulfric also escaped from Helgen alive, and reports indicated that he was preparing to step up his campaign, Tullius devoted most of his efforts to gaining the fealty of the neutral Jarl of Whiterun, Balgruuf the Greater, eventually succeeding when Balgruuf declared his loyalty to the Empire in exchange for Imperial reinforcements to defend Whiterun from an imminent Stormcloak siege. This page was last modified on 8 October 2018, at 01:03.